Bea Cohen, now 104, used to "collect black widow spiders and sen[d] them to the University of Southern California so that their strong webs could be used in the crosshairs in the sites of submarine periscopes during the Second World War." As told by KCET, Cohen is of the few people still alive who witnessed the beginning of World War I (she was four years old, living in Romania as bombs fell on her town's factory). She later worked as a munitions factory worker during WWII, then joined the army, where she served in a communications team as well as sang in the choir and played in an all-female baseball team. After the war, she married a man named Ray Cohen, a POW who had been held in the Philippines for over three years. 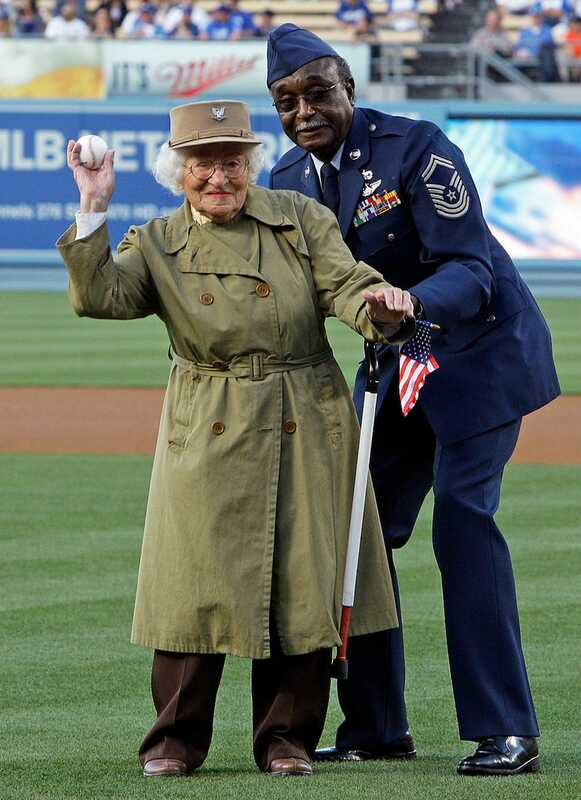 She's been active in military support for almost seven decades and continues to support veterans in her community; in 2012 (the year this photo was taken, at a Dodgers game) she was asked what her goals were for the year, and she said, "to collect clean, white socks for homeless veterans, and to meet First Lady Michelle Obama." Cohen did meet Michelle Obama, and Mellie, too.